If you have a car and iPhone or an iPad with a data plan you may want to give Parker a try. Parker can be downloaded for free. Although this App can be used on both iPhone and iPad, currently you have to select “iPhone only” from the App Store categories (top menu) to find it. Otherwise it won’t show when you look for it on the iPad. What can Parker do for you? Parker shows you the location of open parking spaces on the map. 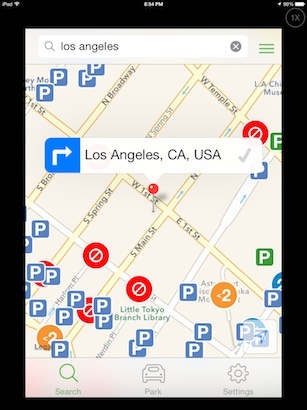 You can tap on the parking spots available to get more information such as price, hours and payment options (i.e. cash, credit card, etc). 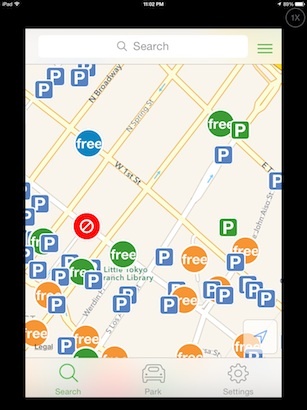 Once you find a free spot, you can tap on it and get turn-by-turn voice navigation. 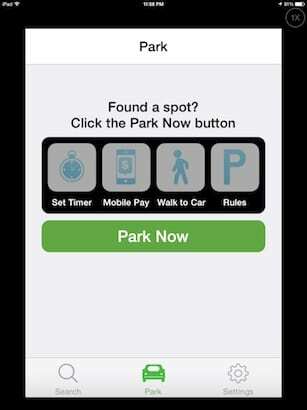 After you park, you can tap on the Park Now button. This will register your current location and display new options such as “Set Timer” for meter expiration, “Mobile Pay”, “Rules” (parking rules) and “Walk to Car” for directions back to your car. Do not get too excited yet… while new parking information is being added continuously, for now only certain cities and universities in the UK and US are covered. However, the list is growing. Current city list includes Birmingham, UK, Capitola, CA, Clemson University, Ellicott City, MD, Fort Lauderdale, FL, Hollywood, Indianapolis, IN, Jacksonville, FL, Los Angeles, CA , New York City – The Bronx, Roosevelt Island, New Brunswick, NJ , Oregon State University, Redwood City, CA, Reno, NV, San Carlos, CA, San Mateo, CA, San Francisco, Studio City, CA, University of Maryland, College Park, Vancouver, WA, Venice Beach, CA, Washington D.C.
Would you recommend other parking Apps? Which ones? Have you used Parker on your iPhone or iPad?